So, how do these food donations work? First, supermarket clients are invited to buy more food. 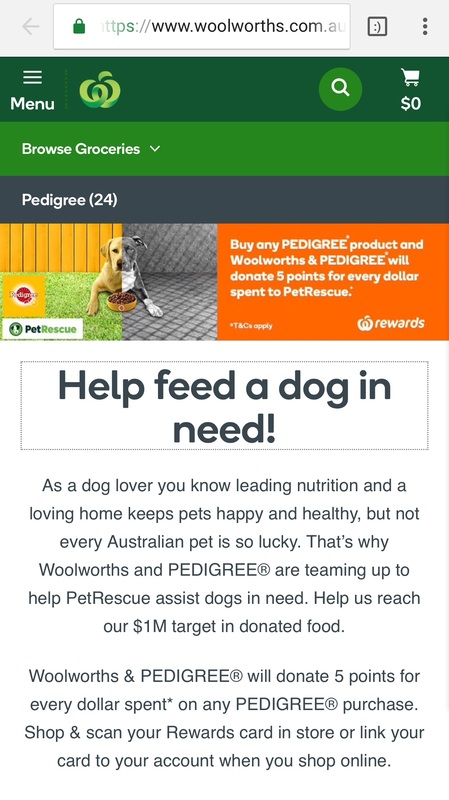 Then these companies make a product (food) donation to rescue groups. And hey, you know what? That's absolutely fine. If rescues get food and food-selling corporations get good vibes, then there is absolutely no problem at all with that set up. It works for everyone. 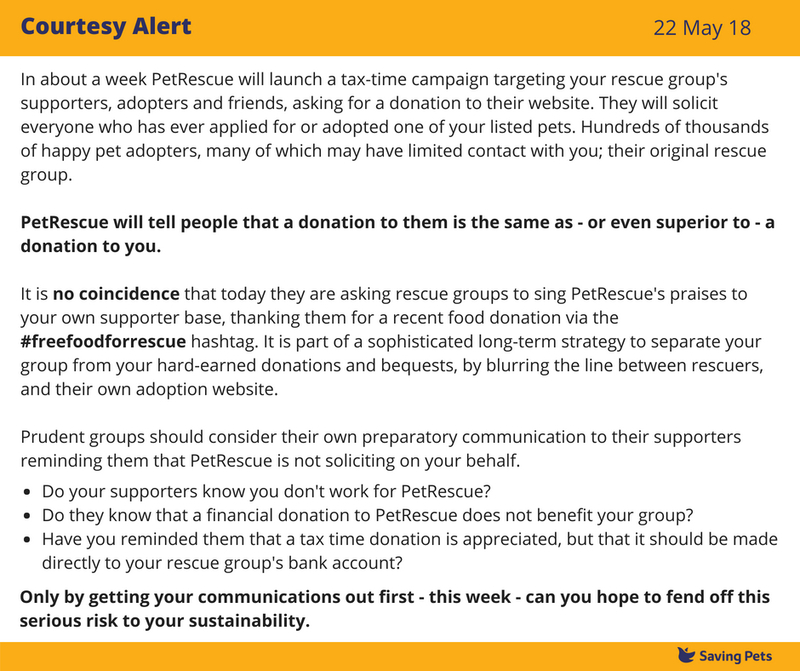 So by far the most significant thing PetRescue says it "does" is provide food to groups. 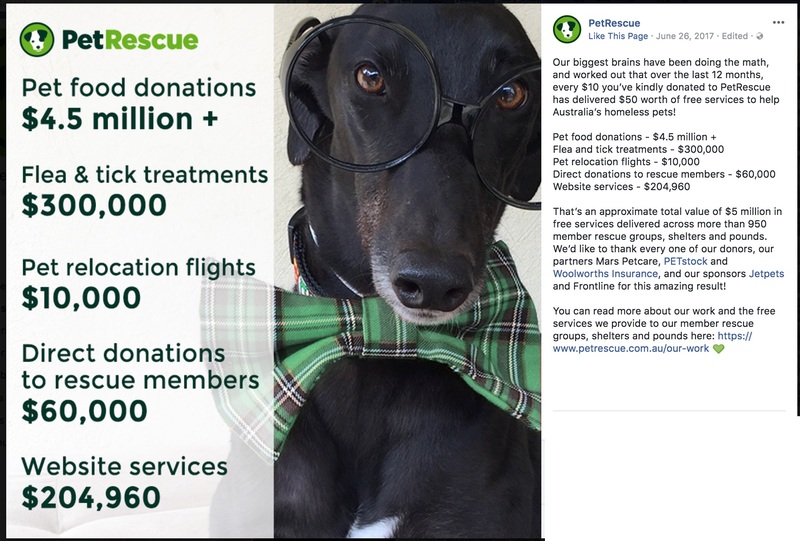 And they're now using this program as validation for their fundraising with the idea that $10 donated to PetRescue delivers $50 in "services". And that this has worked so well for them, that they're now over 50% donation funded. It should go without saying that absolutely no cash donations should be being redirected from rescue, to be invested in helping multinationals sell more product. 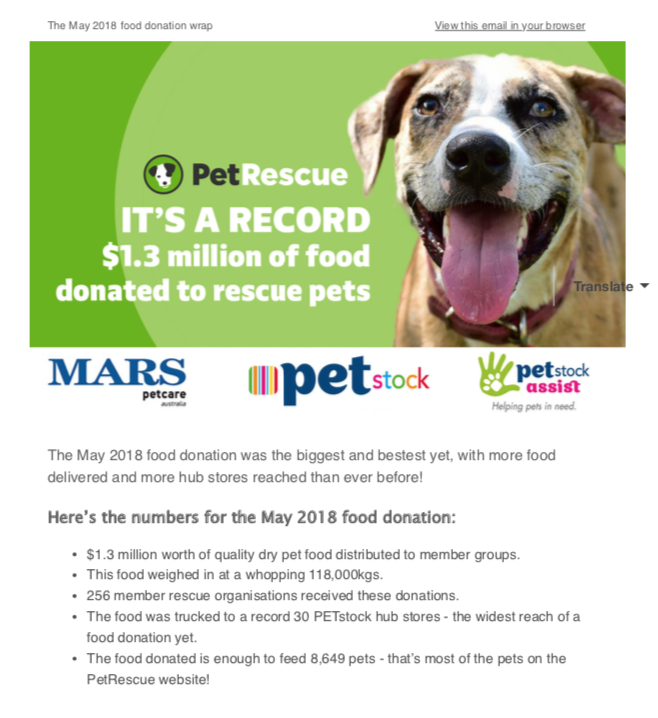 If MARS and PETstock want to deliver $4 million dollars worth of food donations to rescue groups for the purposes of brand awareness, good vibes and social media fodder - then great! These companies pay for someone to fully coordinate that process. 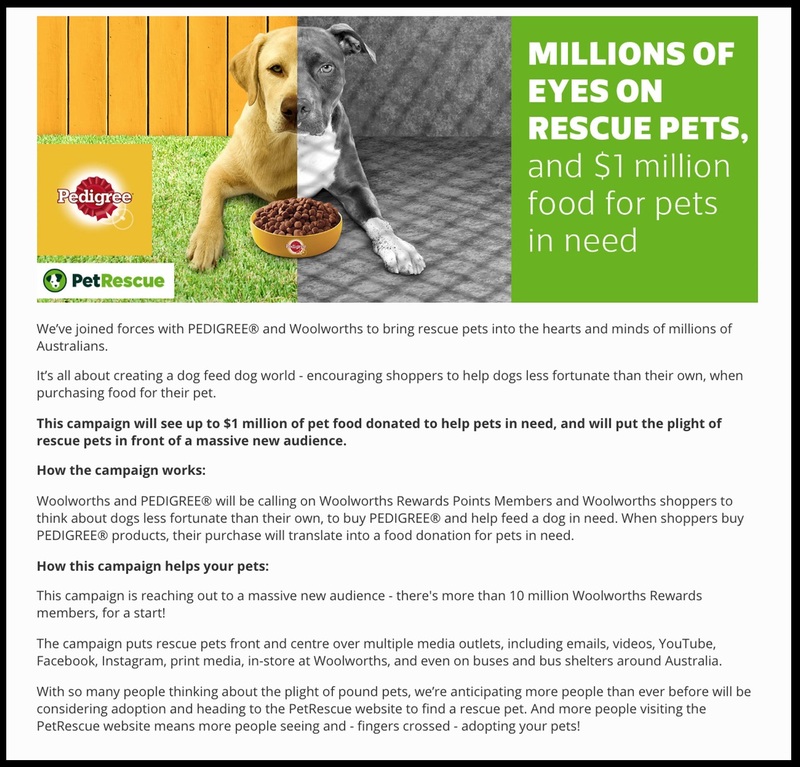 PetRescue shouldn't create a cottage industry of taking public, charity donations for the purposes of them hiring staff to do the grunt work for a for-profit corporation. That's literally taking charity monies and giving it to the marketing department of an international pet food company. 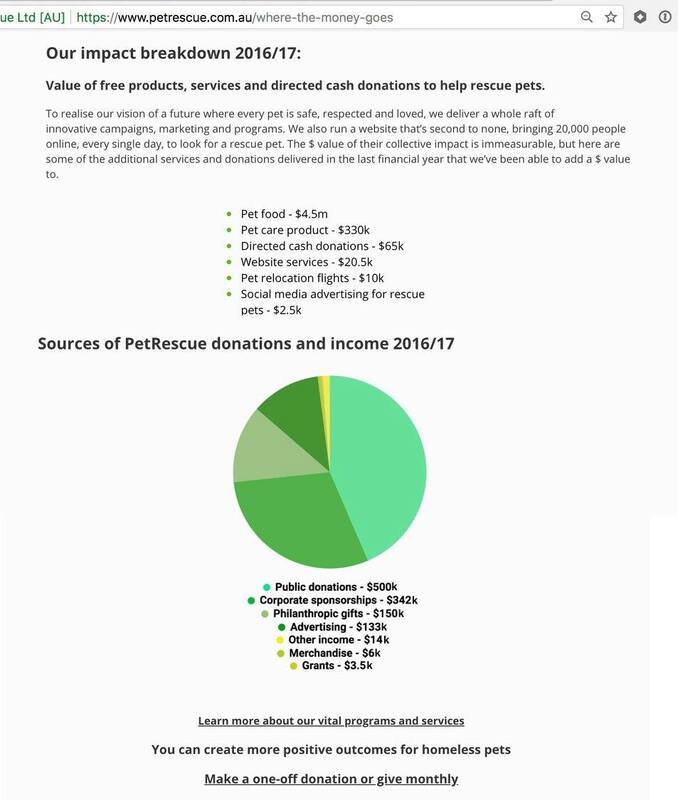 Sure, the corporate relationship agreement might state that as part of the total sponsorship package that is given to PetRescue, that they get both cash money (which shows up in the pie graph above as "Corporate sponsorships") and product from MARS for distribution to members. And that this is then left for PetRescue to "sort out". But distributing the spoils of a corporate sponsorship package, is not a valid reason to seek public donations. It just isn't. Which is why this alert is more relevant than ever.